This is Kerra, the new love of my life. 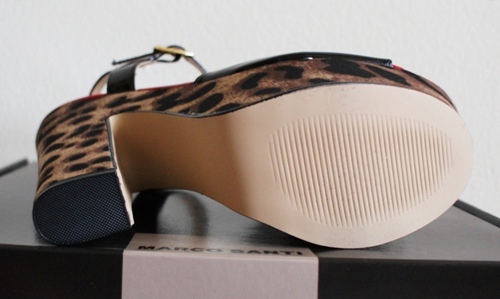 She has a black faux patent upper and a leopard print wrapped platform, with red patent accents. Kerra fits TTS and is oh so very comfortable! The textured sole and heel help prevent falling flat on your arse. I really really love the peek-a-boo red patent accents. For those of you who have Esme, the silhouette on Kerra is very similar. Esme is also very comfortable, I highly recommend her too! Sole Society lists the heel height on Kerra as 4" but it's definitely 5.25" (the same as Esme). The platform is 1.75" so the shoe actually feels like a 3.5" heel. When my new sole mate arrived, I just happen to be sporting a perfectly matched red pedicure. I would say that the toe box on Kerra runs a bit wide, so those of you with narrow feet may find her loose around your toes. My feet are wider in front, so these are PERFECT for me! This shoe fits me so well! I had no issues with not having enough holes to buckle the ankle strap. The ankle strap also has an elastic attachment to the shoe for extra added comfort. Now I have to decide if I want Kerra in the other two colors too....Hmmmm, what do you think? That's my review of Kerra! She's awesome! I'm excited for this non-winter winter to end so that I can finally wear my beloved pumps and sandals once more. I'm sure Kerra will make another appearance on the blog fairly soon, I'll let you know more about her comfort level once I wear the shoes out. Do you own this shoe? If not, get Kerra here. What do you think of Kerra?